So, in case you are wondering; no, you cannot load custom fonts on an iPad. One of the things the Fiasco guys have been taunting Fiasco fans with is their upcoming compendium with all sort of new Fiasco goodies, including a hack of the system that let's you play the game in a way to recreate 80's teen comedies in the style of John Hughes movies. They (well, Jason Morningstar, the prime designer of the game) likes to call it a "gentler" fiasco. This dovetails into a recent spring break trip where we took the kids to a local indoor water park for a few days. Floating around the lazy river, one can't help but notice the many late-teens who are life guarding the place, kind-of watching over numerous kids under 8 years old and their parents. Not too mention the kids workgint eh towel counter, the ticket redemption area of the arcade, etc. It can't be THAT luxurious of a life, but granted, probably better than slinging burgers. One of the movie I've enjoyed in the last year was Adventureland, which did a really good job as far as capturing the whole 80's teen movie zeitgeist. And it seemed to capture some of the realities of someone I knew who used to work summers at Great America. Things like there being a sort of pecking order with regards to your position there, and how the coolness of the jobs there were directly proportional to how easily you could accidentally a group of people. In other words, the ride operators had the cool jobs; the kids hawking the carny games, not so much. 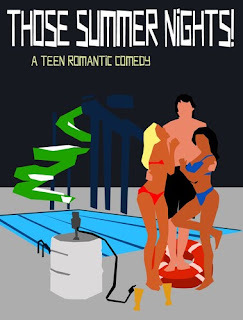 This leads me to the inevitable conclusion of trying to create a Fiasco playset based on a teen romantic comedy centered around these teens who work the summer jobs at a local water park. Which had some interesting little battles. The typical Fiasco playset includes all sort of nasty things. Things that people want to keep secret, things that people desperately wants, and things that can lead to violent deaths. While there are emotional stressors in your usually teen comedy, they generally don't have any truly violent or despicable detail. There's a certain innocent quality to those things. I was looking for things that were more bittersweet and less violently confrontational. It was kind of fun plucking out interesting little bits of high school experiences from 25 years ago to put into the playet, such as using film canisters to carry not rolls of film, but as a secret compartment to carry vodka shots. And there's a lot of elements to create. It's strangely seductive to create or suggest dark "what's the absolute worse way things can go wrong" details given the confines of a certain theme. But coming up with simple objects and needs that try to lead a story down the path of "the geeky guy trying to win the cute girl" angle of Say Anything is kind of hard due to the simplicity of the situation at hand. heck, the standard Fiasco playset usually has a whole category dedicated to weapons. The Tilt Table has the same issues, of course; and in some ways is much worse, as they are designed for things shift the game into complete disastrous chaos and bodily harm. I needed gentler tilts obviously. I threw away pretty much the entire aftermath phase, and replaced it with something else. Something that again, doesn't have the characters writhing in agony over loss of limbs, but instead constitutes telling the story of that crazy summer with questionable truths to their character's kids. So, hopefully, Ducky DOESN'T die (like he would in a normal Fiasco game), and Bender does the get the girl in the end (while defiantly shoving his fist in the air, of course). Feel free to take a peek at the PDF here. It's uder the "files" section. If it doesn't make any sense what-so-ever, you might want to check out the free sample of Fiasco here. As a strange side note, Those Summer Nights! is oddly sitting at the top of "The Hotness" chart for RPGs on RPGgeek. The file itself only has 14 downloads. It's sort of an interesting comparison of the kind of hype it takes to get anywhere near the hotness top on the BGG side. I'm guessing it's because BGG is truly the one-stop shopping area for board game geek, while RPG geeks have a bunch of other sites floating around in that network. So it's easy to skew the hotness charts on the RPG side. I fatigue easily on a design. Part of it is that I don't really have a nice continual stream of playtesting. And so, as a game gets fudged this way and that, a new design experiment comes along that captures my attention like a moth to a flame. At which point the old design gets scuttled own the shiny new design....which winds up getting scuttled for something newer. Strangely, I do have a relatively nice stream of play testing ability more than most. But we only meet for every other week, and typically only two games get to the table. So I maybe get only one playtest a month or so out of a game in order to try and make sure everyone gets a chance to be in the spotlight. And so, My Little Vineyard continues apace, with a new change every month or so. The link off to the right there is really old and moldy...the link on boardgamegeek is about 1.5 versions behind. But I had thought I was coming close to actually finishing it. Really close. Everyone in the group seemed to like it (which is surprising given the wide array of tastes in games). And so, I figured the last playtest would be strong with just a couple of tweaks to points and such. Maybe because people have become familiar with the game now, they are now able to see some issues that weren't there before. Not that this is bad...just discouraging as it seemed the finish line was close. Fatigue is really settling in with this game at this point, as these probably 3 other projects I have a great desire to work on at this point, and that "1 play test per month" is valuable, indeed. The biggest issue was where one of the players felt helpless after realizing that the action he had taken three turns ago was a poor one, and now that he had realized it, felt there was no way to rebound from it and catch up to the rest of the players. This bothered me quite a bit the more I thought about it. If you make an obvious bad play in most games, you get "penalized" for it and learn from it and move on. It left me wondering if the obvious bad play wasn't obscured enough; I've been playing Agricola some lately, and one of the comments that comes from that game seems to be along the lines of "I lost again! And I don't know how." Anyway, this lead to a fairly interesting discussion of fixes for the game, which would seem to complicate things further. Additionally, the fatigue that had worn on in the design of the project I could now see stretching further out down many more months. Granted, these aren't working man-months; really just an hour or so here and there in between playing. But still, the real-time length to completion is painful indeed. As things usually happen, over the weekend I spent some time digesting the comments, and trying to come up with solutions. What I've noticed is that a lot of my project usually wind up with me adding more and more things to them, then near the end, a great purging happens; suddenly there's a realization that a lot of those things aren't needed, and removed. And that is what is happened on this next revision of the game. I think the game will be better for it, and it addresses the issues that were brought up. And hopefully I can move on to something else soon. Strangely, while I think that this is probably my most commercial-ready design, it is also somewhat less appealing to me than other designs which are a bit more experimental. And that's what I'm missing playing around with.